Please Note: Due to a power outage causing QSource.com to go down last Friday, we are re-running this Featured Product Friday for another three days this weekend. 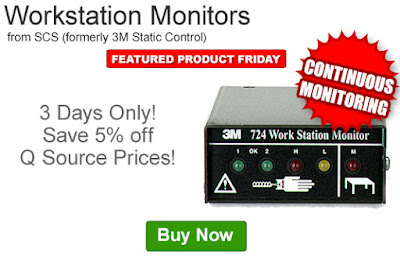 Save an extra 5% off the Q Source price of SCS Workstation Monitors. Our FPF110416 Coupon Code is auto applied when you add an eligible workstation monitor to your shopping cart. This Featured Product Friday (FPF) promo is valid from today, November 11, 2016 through Sunday, November 13, 2016 and the code is unlimited use. Ensure proper grounding and avoid potentially dangerous ESD damage incidents with these workstation monitors from SCS (formerly 3M Static Control). Monitor various combinations of people, wrist bands, and equipment, depending on the monitor model selected. Click here to shop, or for further questions about Featured Product Friday, please read our informational blog post, call us (800-966-6020), or send us an email. Please note: This promo is valid only at QSource.com and expires on November 13, 2016.